Use the Calendar tool to arrange and visualize unit events in multiple views and enable integration of unit content and your Calendar. You can use iCal to synchronize the Calendar tool to your personal calendars (such as Outlook and Google Calendar, as well as iPhone and Android). Use the calendar views area to toggle between different event display layouts. Use the Agenda view to group your unit events by Date, Unit, or Category - events display in chronological order, and all-day events display at the top of each grouped listing. Use the Day, Week, and Month views to group your events in daily, weekly, or monthly increments. Use the List view to filter your events by Assignments, Checklists, Discussions, Grades, Materials, Modules, Quizzes, and Surveys. Use the calendar content area to navigate through your content. Navigation will vary depending on the view you select. 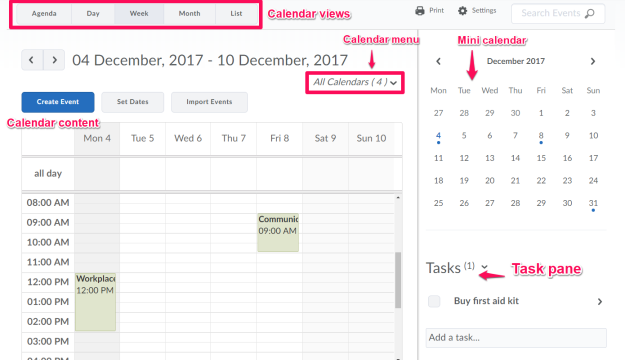 Use the calendar menu to select multiple calendars to display, change the color scheme associated with individual calendars, and add new calendars. Use the mini calendar to navigate quickly to a specific day, week, or month. Use the task pane to create, track, and maintain personal tasks. On the unit homepage, click Calendar. Use iCal feeds to access your Calendar events outside of the learning tool. With iCal feeds, you can view your unit events in external calendars such as Microsoft Outlook and Google Calendar, and on mobile devices such as iPhones, BlackBerry smartphones, and Android phones. Subscribing to an iCal feed syncs your external calendar application or device with the Calendar tool, keeping you updated without logging in to Connect. Refer to your device or application instructions for adding an iCal feed, as each application can have a different method for managing iCal feeds.